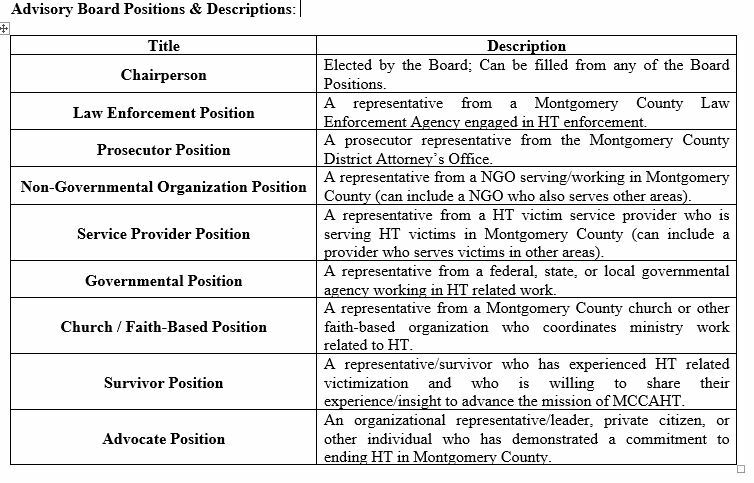 The Montgomery County Coalition Against Human Trafficking (MCCAHT) recently established its first Advisory Board. The MCCAHT (established in 2015) is a partnership of local, state, and federal law enforcement agencies, governmental and non-governmental organizations, churches, social service agencies, advocacy groups, and individuals with a mission to eliminate human trafficking in Montgomery County, Texas. As the leadership team for the MCCAHT, the Advisory Board’s duties will include: 1) meeting and event planning and coordination; 2) developing public awareness strategies and resources; 3) gathering input from/serving as a liaison with relevant constituencies and survivors; 4) providing feedback to the organization from the community; and 5) providing technical expertise. The MCCAHT Advisory Board (“the Board”) is a collection of individuals who bring unique knowledge and skills to more effectively guide the MCCAHT (“the Coalition”) and achieve its mission. The Board serves to make recommendations and/or provide key information, direction, training, coordination, and materials to the Coalition and its members. 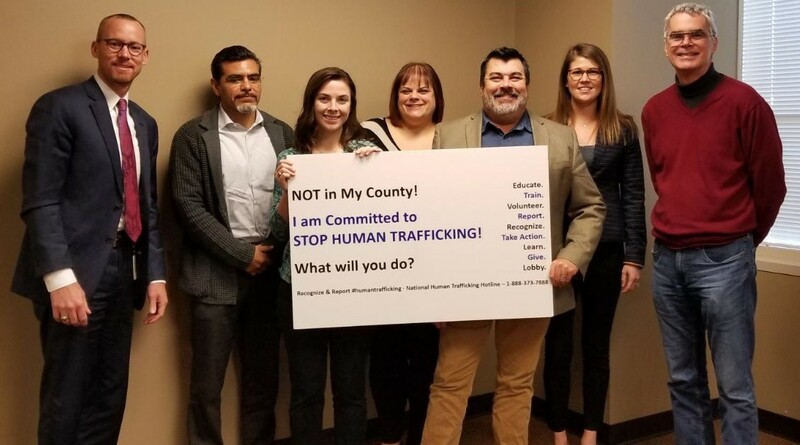 Advisory Board members were selected through a competitive application and review process and must have already demonstrated a commitment to eliminating human trafficking in Montgomery County. Each Board member was selected to fill a specific position on the Board based on their expertise or experience and commitment. The Advisory Board held its first meeting and Board orientation on January 10, 2019. The next MCCAHT Coalition meeting will be on February 21, 2019, at 1:30 p.m. at The Woodlands United Methodist Church. 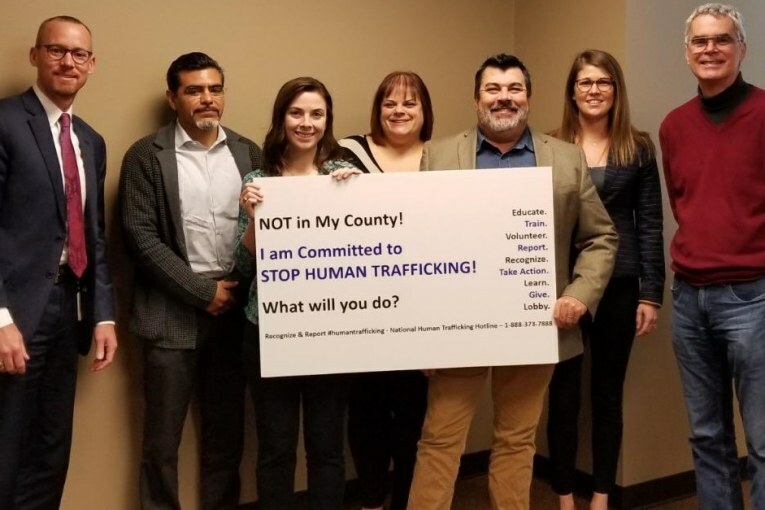 The Coalition meetings are open to anyone wanting to get involved in fighting human trafficking and exploitation in Montgomery County, Texas. Follow MCCAHT on Facebook at www.facebook.com/MCCAHT. Left to Right: Tyler Dunman (Chairperson Position – MCDAO), David Diaz (Governmental Position – HSI), Meghan Miller (NGO Position – CAC), Ashley Steel (Advocate Position), Dennis Mark (Service Provider Position – Redeemed Ministries), Laura Bond (Prosecutor Positon – MCDAO), and Joe Vanderslice (Faith Based / Church Position – TWUMC). Not Pictured John Godden (Law Enforcement Position – MC Sheriff’s Office).